Two gods down, seven to go. Valentina is having the worst time of her life. 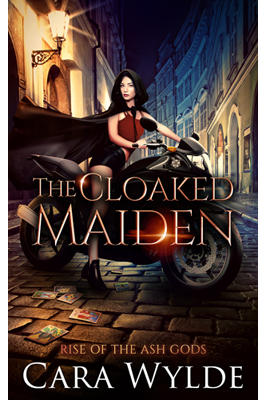 On the run from an invisible enemy, she now has to track down the rest of the gods of the Major Arcana and convince them to help her save the Mysteries of the Tarot and the world. On top of that, she has to deal with her twin sister, Ravenna, the Curse of the Moon, and the two sinfully hot gods she’s managed to trap in her tarot cards – Loki and Veles. She’s too far from home, her family and her coven are in danger, and the last thing she needs is two powerful beings to fight over her. Or even worse, four! When she accidentally runs into Jupiter, the God of the Sky, and his frenemy who calls himself Death, Valentina has to accept her fate. She’s the only one who can make the stubborn, arrogant, egotistical gods with too much power to yield work together. The solution?